Yesterday Mom and Dad took me for a ride on the Natchez Trace Parkway. I like to ride almost as much as I like to go for walks. The Trace was a road for travelers after they took stuff down the Ohio and Mississippi rivers to sell in New Orleans and other places. They left their boats at the end of the trip and walked back to their homes. The Trace runs from Natchez, MS to Nashville, TN. People often got robbed because bad guys knew they carried lots of money. Now there is a paved two-lane highway but parts of the old trace are still around in the woods. We saw wild turkeys and I knew Mr. Word would like to shoot them but they are on federal property so I think it’s not allowed. Our first stop was near some trails. I had fun when we got out for a walk. I even walked in a creek. We went down a horse trail and met a lady on a horse. I didn’t bark at them and the parents were proud. This is me sort of on the horse trail. I sniffed everything! We got back in the car and Mom gave me some water from a bottle. I was thirsty after all that sniffing. Dad thought it was funny that Mom’s jeans got wet when I drank out of the bottle. On our next stop we saw the War of 1812 monument. It commemorates Andrew Jackson taking troops down the Trace to fight in the Battle of New Orleans a long, long, long, long, long time ago. Lots of stuff to sniff there. On the way home we drove through historic Leiper’s Fork. I don’t know why it’s famous except that lots of celebrities live there, especially country singers. I had a fun day! Today was a rainy day and Mom knows I don’t like to do my business in the rain. She made me go into the backyard anyway. I sniffed around and did number one. 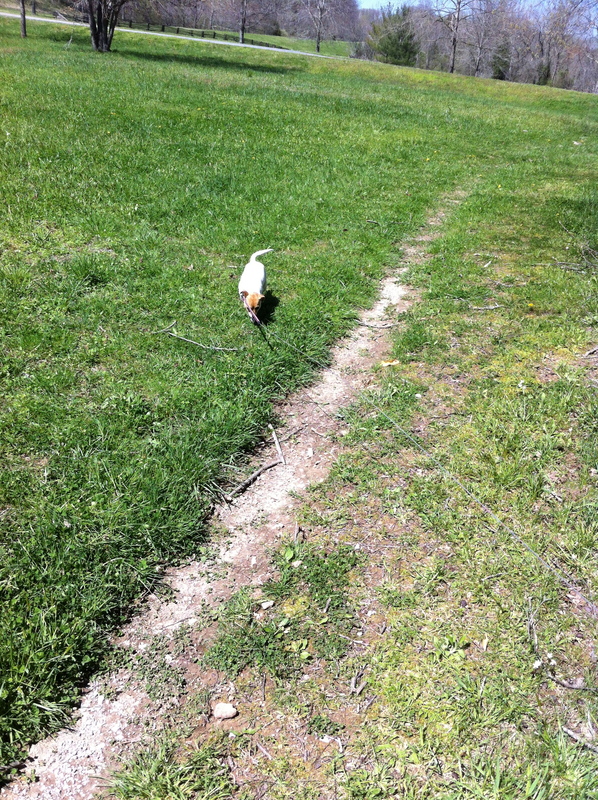 When I finished, a rabbit ran from under the evergreen trees. I chased it! We ran up the yard, we ran down the yard, and we ran up the yard again. Finally, it slipped under the fence and ran into the woods. I didn’t fit in the spot the rabbit found. Dad said he’ll have to check the fence to plug any holes so I can’t get into the woods. I wish he would make the hole bigger. The woods are full of animals that need exercise. Chasing rabbits is more fun than chasing cats! For the rest of the day I wanted to go outside a lot in case that rabbit came back. I got all wet but didn’t mind that a bit. Mom says I smelled funny, but I didn’t care. While she wrote a short story I dried myself in front of the heater beside her desk. Mom said she hopes there isn’t a rabbit nest under the evergreen trees. Dad said he hoped the nest wasn’t under the deck. They found kittens under there one day. I haven’t looked yet because my nephew, Mister, got into trouble with his parents when he found a baby rabbit. 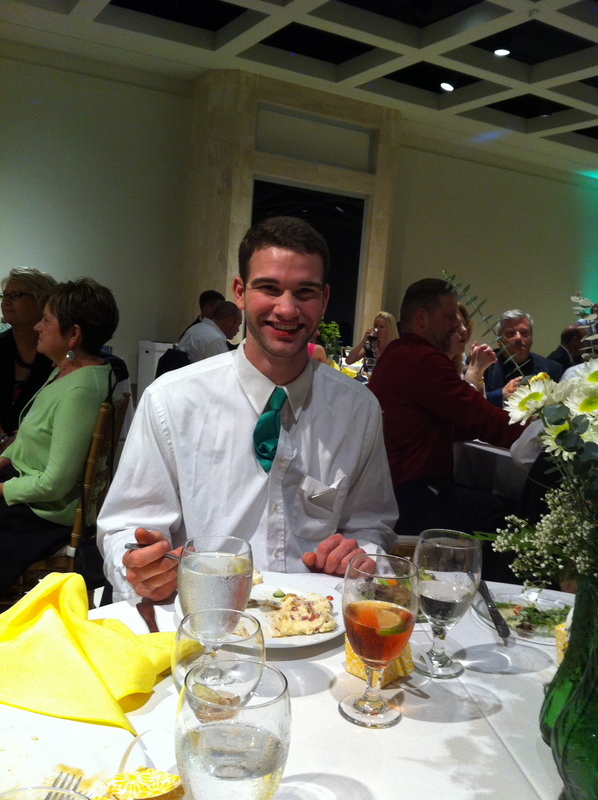 This weekend my family took another road trip, this time to Jacksonville, Florida for my cousin Jessica’s wedding. When it was time for the wedding at the Cummer Museum, I had to stay behind in my jail crate. Everyone had fun and ate lots of goodies. All I had was a dumb ol’ chew stick. Mom and Dad didn’t even bring something back for me. 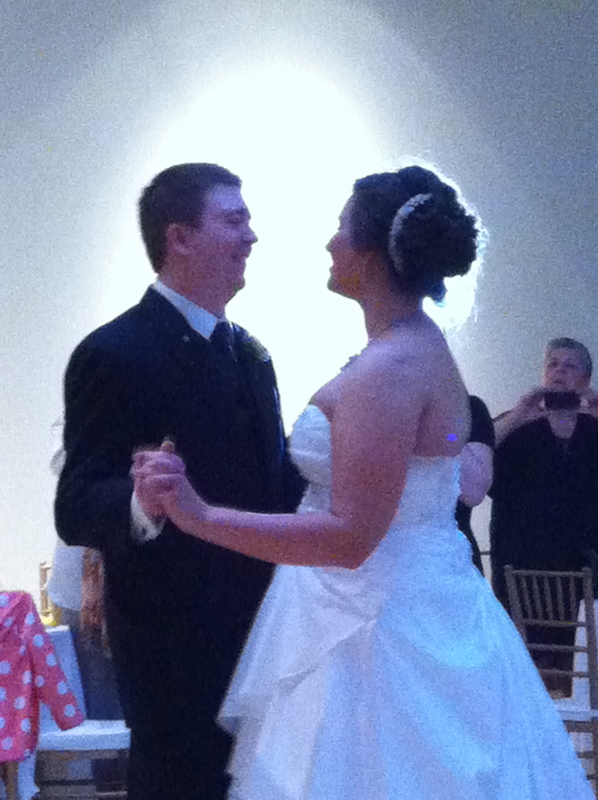 Here are the bride and groom having their first dance. 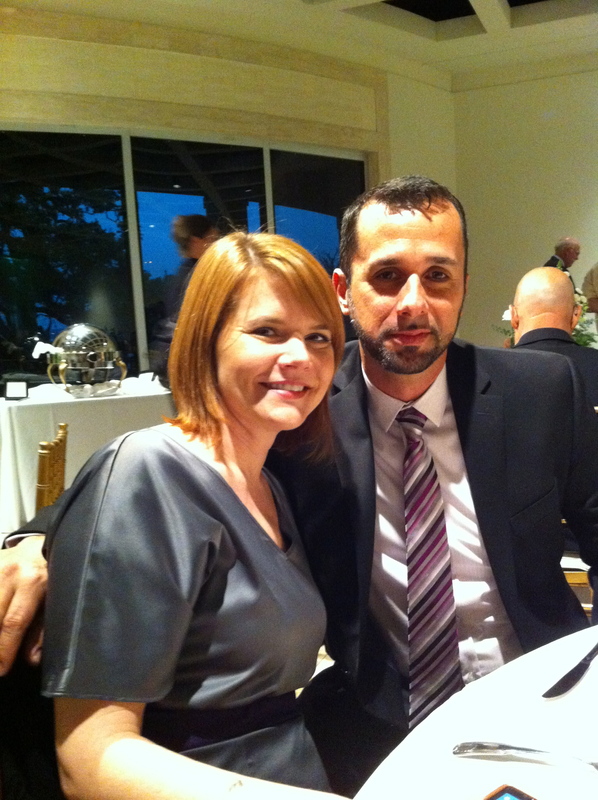 This is my sister, Melanie and her friend, Tony. 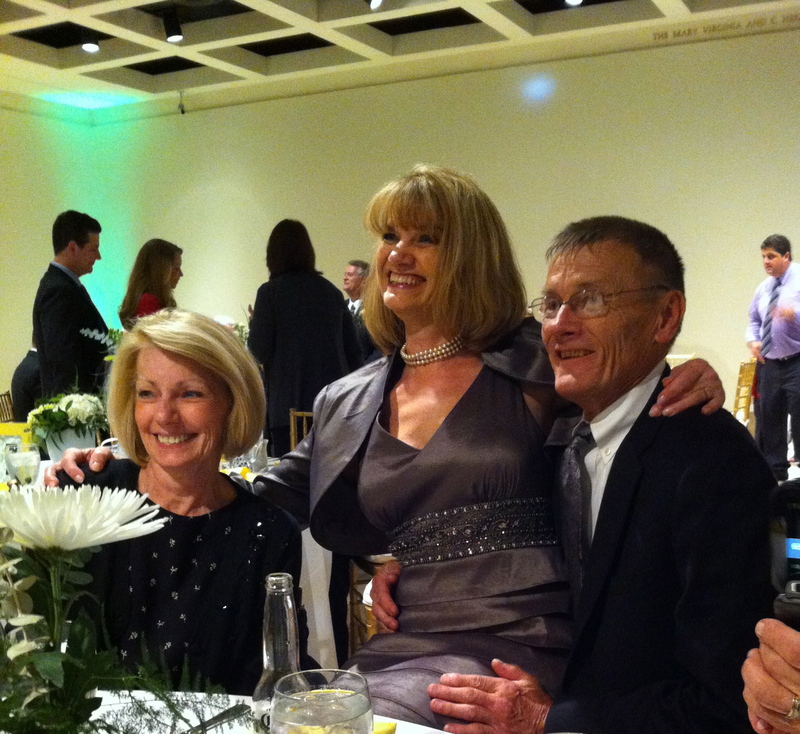 This is Aunt Faye, Aunt Grace, and Uncle George. Grace and George are Mom’s sister and brother. 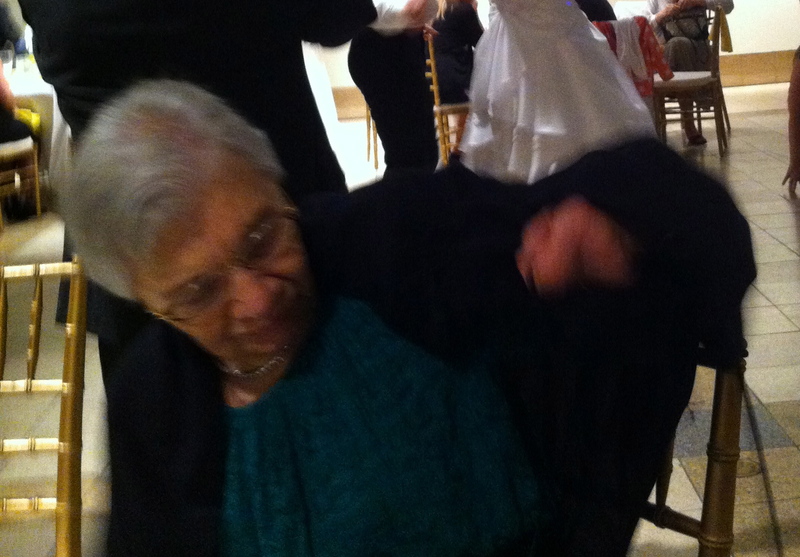 Aunt Grace is also the MOB (mother of bride). Aunt Faye is married to Uncle George. More about Aunt Faye in a minute. This is Grandma. She likes to fly instead of drive. This is John. He is the BOB (brother of the bride). The family sometimes calls him Little John because his dad is also named John. Little John is pretty tall and so is regular John, the FOB (father of the bride). 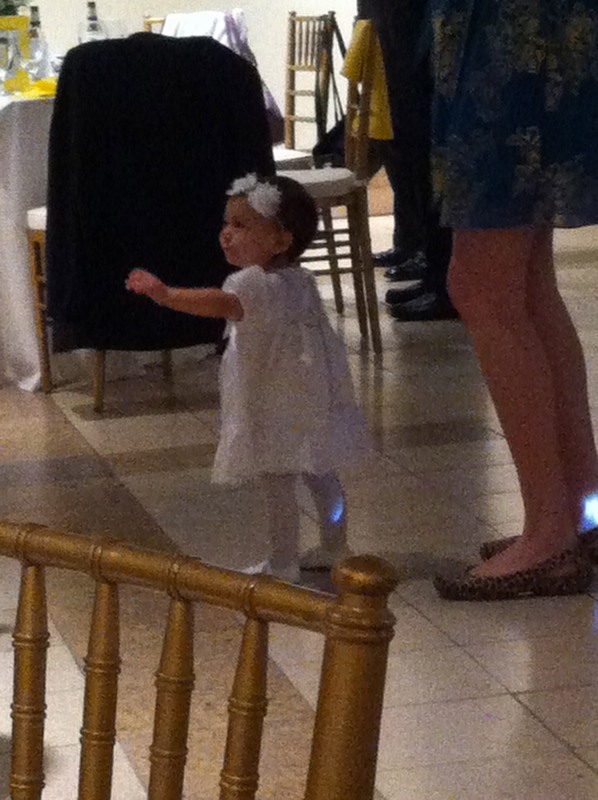 This little girl was a flower girl. She’s not much bigger than me and she was invited to the wedding. I could have been a flower girl. The next day Aunt Grace invited us to her house for brunch. This time I was lucky. I was the only dog in the house and everyone thought I was cute. Aunt Faye likes dogs but not in her lap so I jumped into her lap every chance I got. People gave me treats and I got stepped on once. The best part of the weekend was that I got to be in Mom or Dad’s lap all the way to Jacksonville and all the way home. We’ve been on a family vacation this week. A vacation is when you leave home and stay some place different. The cats didn’t come but that’s okay with me because I got all the attention. They would have enjoyed being here. The beach is one giant sandbox. On the way to Ft. Myers Beach we spent the night with my sister, Melanie, in Orlando. It was the first time we met. 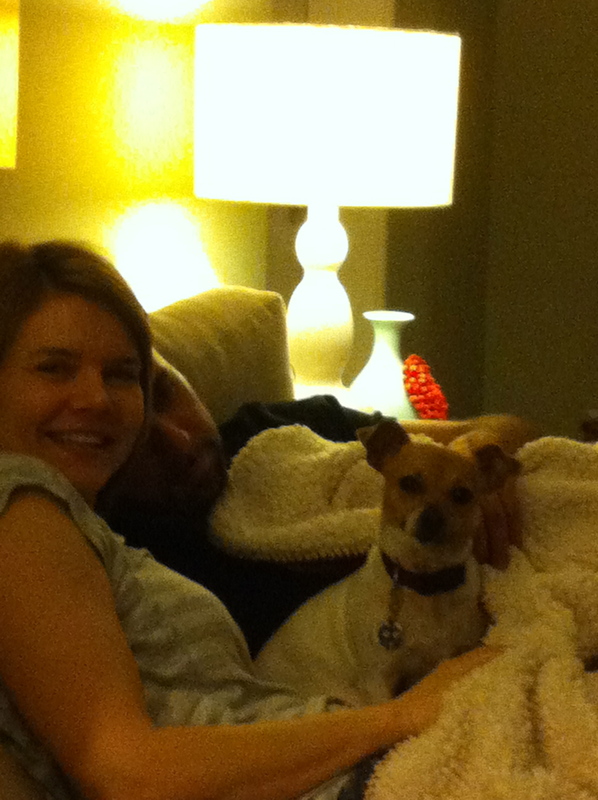 This me, Melanie, and Tony on her sofa. They give good belly rubs. After we got to the beach, I made friends with John and Cheryl. They live in the apartment next to the one we rented. They’re lucky because they live here all the time. John installed a pet gate so a puppy dog doesn’t have to stay chained on the balcony our apartment shares with theirs. One night, when John and Cheryl’s door was open, I went in and jumped on the sofa with Cheryl. She gave me a good belly rub. Mom said it was rude to walk into someone’s house without knocking, but John and Cheryl didn’t seem to mind. Speaking of belly rubs, I’ve gotten lots of them this week. 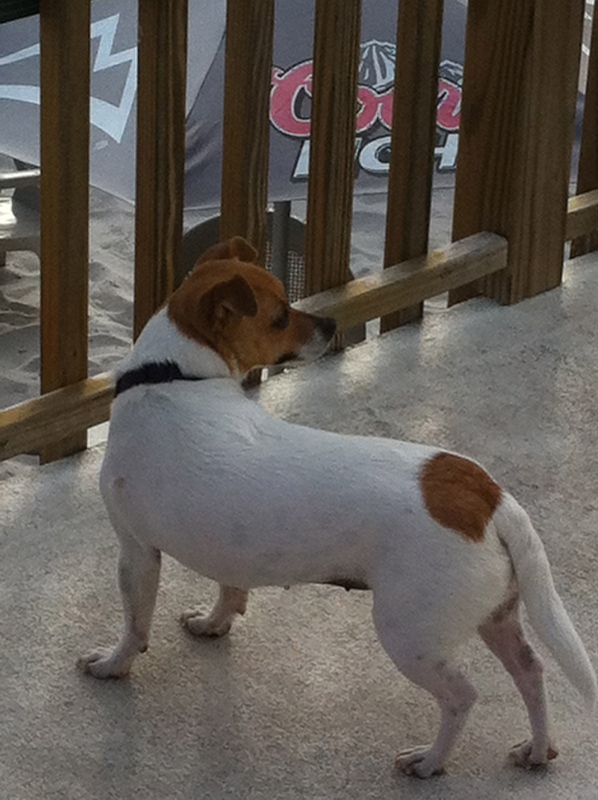 People on the beach think I’m cute, and of course I’m friendly. I’m irresistible! Here I am waiting for someone to come by and rub my belly. The worst day was when Mom and Dad went to a baseball game. If I were in charge, the rule would be that friendly dogs can go to the stadium. I had to stay in my crate jail. Mom said she heard me whine all the way downstairs. Everyone needed to know I was unhappy. 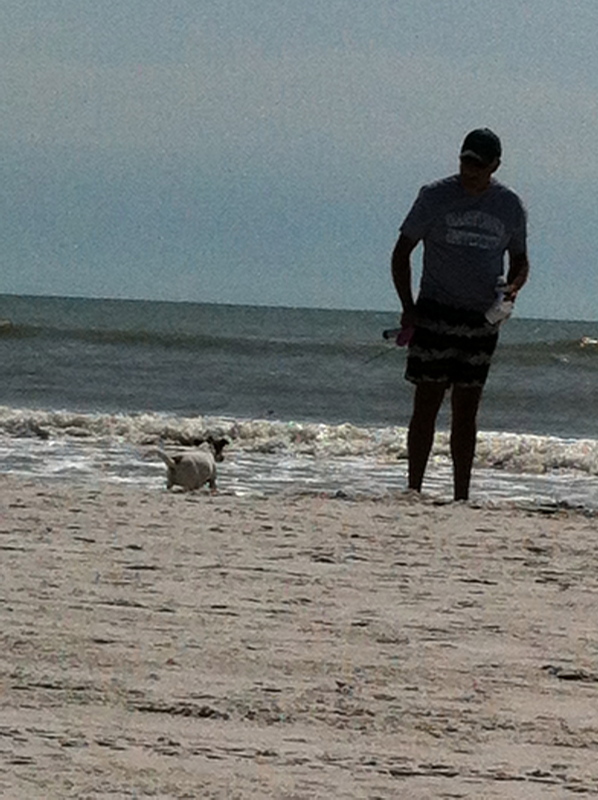 People shouldn’t bring really big dogs to the beach – or any other dogs – just me. I growl and bark at them. All ten pounds of me are fierce. 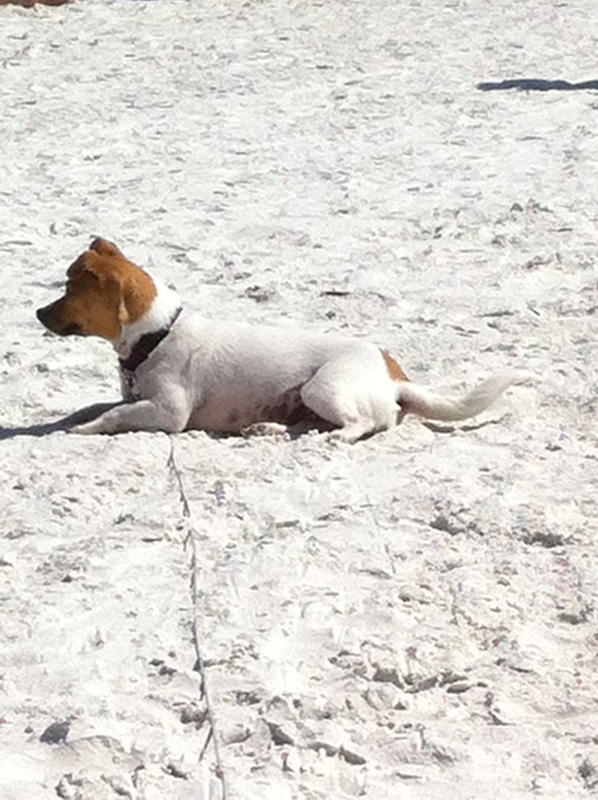 but I do like to dig in the sand. 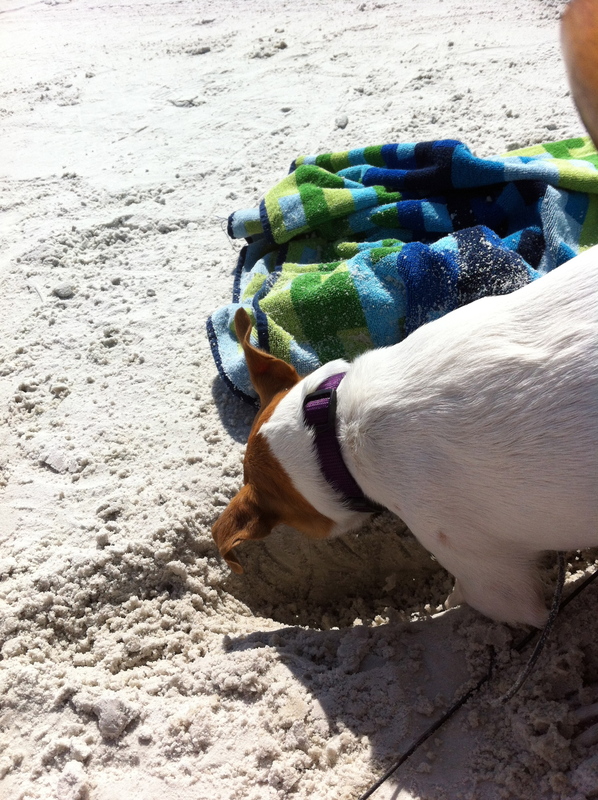 If I sniff too hard while I dig, I get sand up my nose and sneeze a lot. I’m sure going to miss the beach when we leave. This was a great place for a road trip. When the good folks at Critter Cavalry Rescue said I would get spayed as part of the adoption fee, I thought they meant I could dig in the dirt with a shovel. Boy, was I wrong! Spayed is an operation. It means I can’t have anymore babies. Maybe if my first owners had me spayed, they would have kept me and my babies instead of sending us to a shelter. We got out of there just in time. Mom says there are too many unwanted pets wandering the streets and neighborhoods as well as too many surrendered to shelters. If everyone got their pets spayed and neutered (that’s the boy operation) a lot more animals would have good homes like mine. I spent the night in the hospital and then the lady said to keep me quiet for 5-6 days. Mom and Dad rolled their eyes. When I run across the backyard I have to take some leaps. Mom thinks I’m part kangaroo. I’m still a little sore when someone touches me too hard on my tummy but that’s getting better. By the way, my friend Juju is in a beauty pageant. You can vote for her here. She’s a cat, but that’s okay with me. My mom votes for her every day.